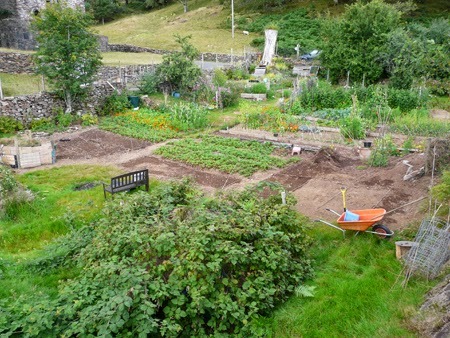 Our veg patch is big and previous, over-ambitious plans to cultivate the lot have failed. Clearing thickly matted couch grass with reeds and bracken is hard graft, as testified by broken fork; a top of the range Wilkinson Sword with wooden handle. It must have cost £35 just a year ago but sadly the handle was not designed for replacing. I’ll look out for something more enduring but in the meantime have succumbed to a £5 job from Wilkinson, not the Sword people. Sustainable gains is what I’m looking for. The turf, weeds and excess strawberry plants have been lifted into a rectangular cage of fencing wire, with its walls lined with cardboard to limit the light; hopefully this will biodegrade at the point that the weeds have become great compost. Clear soil is an open invitation for weeds but I’ve got there first and sown a green manure mix of Crimson Clover, Mustard, Red Clover and Italian Rye-Grass. If it does what it says on the label, this winter mix will fix nitrogen, suppress weeds, dredge up minerals, improve moisture retention and soil structure. All I need to do in January is cut it down and dig it into the soil or leave it as a mulch for the worms to drag down. And then we need to plant something else and are thinking of a wild flower mix to see if we can get even more bees and butterflies. There’s still a lot more grass at the bottom of the garden and the plan here is to cut it short, remove the cuttings, and sow Yellow Rattle in September or October; it needs winter weather to germinate in spring. It’s a semi-parasitic, grassland annual which weakens grasses, creates gaps for wild flowers when it dies back, reduces the need for mowing and is called ‘rattle’ because that’s what its seeds do when ripe and dry. We will also be using rattle in the big garden to convert areas of lawn into flower meadows. If all goes to plan there will be less grass, less mowing, less petrol and more time to enjoy wild flowers with their circus of bees and butterflies.